Pushing open the double doors, I looked up at the ceiling. “Dear sweet Virgin Mary, Mother of God, please tell me: What in the wide world of heck did I just sit through?” I asked aloud as I stumbled out of Theater 10, tossing my now-empty soda cup into the trash. This is my review of the Fantastic Four! The Fantastic Four tells the story of four young adults who are brilliant in the field of science. Now I’m aware that this movie is based on the…(looks at info sheet)…the Ultimate Fantastic Four comic book, which debuted in 2004. In previous incarnations of the “First Family of Comics,” as they are called, the Fantastic Four get their powers via space travel. However in this version, it is inter-dimensional travel that graces them with their supernatural abilities. So it’s exactly 1:16 am and I’m very tired. However I’m not going to be like the makers of this corporately-mandated movie and give you a half-baked review; I’m going to use the last of my energy to tell you that this is one of the most passionless movies I have ever seen. Just like Aloha, Pup, Christian Mingle the Movie, Last Ounce of Courage and Bad Teacher, I have absolutely nothing good to say about Fant4stic Four. Here is everything wrong with The Fant4stic Four! What the heck is up with the stiff and wooden line-delivery in this film? If you were telling someone about a project that you’ve spent years of your life working on, you wouldn’t say it in a flat voice and with no emotion, but that’s exactly what happens in this film. The biggest offenders are the kid who plays young Reed Richards, Reg. E Cathey (Dr. Franklin Storm), Miles Teller, and Kate Mara. Okay, I’m going to give Ms. Mara a break because I know that she was verbally abused by director Josh Trank, which could explain her drained and tired performance as Sue Storm. That being said, an explanation is not an excuse for her detached acting. Miles Teller, who was the only entertaining part in The Divergent Series: Insurgent, is completely neutered as Reed Richards. He sounds totally bored every time he speaks. When he does try to inject some life into his character, it comes off as forced and awkward. Reg. E Cathey annoyed me. He’s got a cool gravely voice, but man, he is a drag to listen to. He does have one good scene with Michael B. Jordan where he actually makes a sincere effort to act, but for the rest of the movie, he is devoid of emotion and is practically sleepwalking his way to a paycheck. The only actors who are even trying are Michael B. Jordan, Jamie Bell and Toby Kebbell, but even they become victims of the movie’s biggest problems. 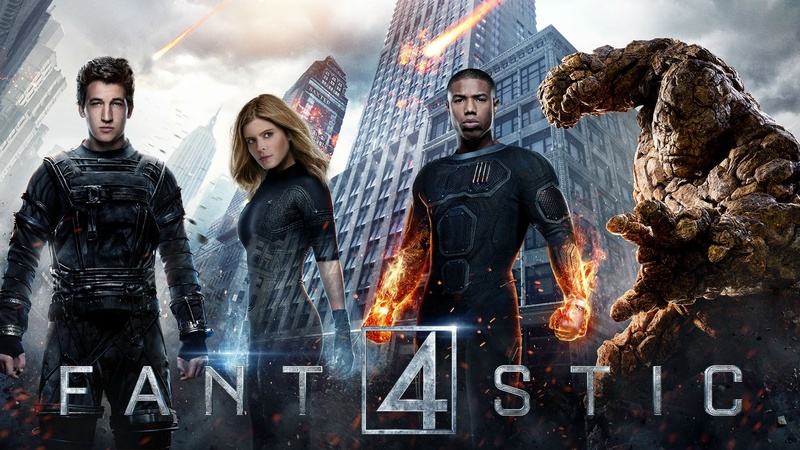 Fant4stic Four has a major character development issue. Personalities of characters will literally switch in a matter of minutes. Jamie Bell will be the cautious one and Michael B. Jordan is the risk-taker, but then in another scene, Jordan is all, “No way, let’s not do that” and Bell is the one walking into a risky situation. One minute, Kebbell is looking out for himself and Teller is the moral one, and then in the next minute, Teller is the self-serving opportunist while Kebbell is pulling back. We’re supposed to believe that Reed, Sue, Ben and Johnny are this family unit who would go through hell and back for each other. If that’s the case, then this movie does nothing to prove it. Reed and Ben feel more like acquaintances instead of childhood friends, the “romance” between Reed and Sue is contrived as all heck, Sue being the adoptive daughter of Dr. Franklin Storm is slapped-on and has no presence within the character and her relationship with her half-brother Johnny (Franklin’s biological son) is nonexistent. Because little thought was put into developing the characters as people, their decisions feel like demands of the script and not organic choices that they would willingly make and their relationship with each other lacks authenticity and heart. One more thing: Yes, the rumors are true. The first act is drunk on tolerably bland build-up. The second/third act of this movie is insufferable and a half-hearted final battle with Dr. Doom is the nail in the coffin. Update: Check out this video on the troubled production of this film, which is actually more interesting than the film itself. Next > Christian Movie Reviews: Do You Believe?